The Reds have hired former Red Sox skipper John Farrell, though he won’t be joining the coaching staff of Cinci manager Bryan Price. Rob Bradford of WEEI.com first tweeted news of the hiring. Farrell will function as a scout with the Cincinnati organization, per C. Trent Rosecrans of The Athletic (Twitter link). It seems the focus will be on pitching, with Farrell beginning his tenure by examining the Reds’ own system, as Peter Gammons explains on Twitter. It certainly makes sense that Farrell will be focused on pitching, as he’s a former big league hurler who made his mark as a pitching coach. He went on to manage the Blue Jays and Red Sox. Farrell’s tenure in Boston came to a close after 2017. Though he had guided the team to consecutive AL East crowns, in addition to a 2013 World Series title, Sox president of baseball operations Dave Dombrowski elected to fire Farrell and (eventually) replace him with Alex Cora. It stands to reason that Farrell will be considered for future managerial openings. The chances of Victor Martinez continuing his career may be “touch and go” in the aftermath of heart-related health issues in 2017, Nick Cafardo of the Boston Globe writes. The Tigers slugger twice suffered irregular heartbeats, the second of which led to chronic ablation surgery in early September that prematurely ended his season. Martinez has one year and $18MM remaining on his original four-year contract with the Tigers, and he turns 39 years old in December, so retirement could potentially not be far away for the veteran. That said, the top priority is Martinez’s health, and everyone around baseball is pulling for Martinez to both make a full recovery and be able to end his career on his own terms, whether after the 2018 season or beyond. Jackie Bradley Jr. could be a big commodity on the trade market, as Cafardo opines that the Red Sox could deal Bradley, move Andrew Benintendi to center field and then sign J.D. Martinez to play left field. Boston’s “need for power is so critical,” Cafardo writes, that the Sox may have to take the hit on defense, not to mention the payroll hit of dealing Bradley (controlled via arbitration through the 2020 season) and spending big on Martinez. Cafardo also noted Martinez as a potential Boston target in his column last week, citing the past relationship between Martinez and Dave Dombrowski from their time together in Detroit. The Giants, Phillies, Royals and Braves are all listed as potential suitors if the Red Sox did shop Bradley, and several more teams would certainly check in on the 27-year-old. Bradley took a step backwards at the plate this season, though he posted above-average hitting numbers in 2015-16 and is one of the game’s better defensive players. Jim Hickey has drawn a lot of attention for pitching coach vacancies around the sport, though Cafardo writes that some around the game consider Hickey to be a potential managerial candidate. He speculates that “the Mets could take a long look” at Hickey, or potentially the Red Sox as they look to replace another former pitching coach-turned-manager in John Farrell. Speaking of Farrell, he could emerge as a contender for one of the open managerial vacancies around the game, or even with the Nationals if they choose to move on from Dusty Baker. One AL executive feels the Nats “would be looking at strongly” if they did make a change in the dugout, though the exec also feels Farrell may take a season away from the game to both increase his job options and perhaps just to take a break from the grind. While discussing teams looking for managers, Cafardo makes the interesting comment that “the Phillies still have their sights on” Orioles skipper Buck Showalter. Once Pete Mackanin was reassigned from the manager’s job in Philadelphia, there was some initial speculation about the Phils targeting Showalter given his ties to Andy MacPhail and Matt Klentak. Since then, however, the Phillies have seemingly moved onto other candidates, plus there’s the obvious obstacle of Showalter still being under contract to the Orioles for one more season. Speaking of the Phillies job, Cafardo also notes that Red Sox bench coach Gary DiSarcina’s name has come up as a possible candidate. DiSarcina worked for the Angels as a coach and front office assistant during Klentak’s stint with the club as an assistant GM. The longtime former Angels infielder has several years of experience in a variety of front office, coaching and minor league managerial roles with the Halos and Red Sox. The Red Sox have announced that John Farrell will not return as manager. The team had previously exercised its 2018 club option over the skipper, but will now change course and pursue another option. A search is set to begin immediately, per the club announcement. The Mets, Phillies, and Tigers are also looking for new managers at this point, so there will be some competition. 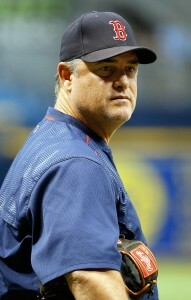 Farrell took over in Boston after the team’s ill-fated 2012 season. The relationship got off to quite a start, as the Sox ran up 97 wins and streaked to a World Series win in 2013. Two-straight last-place divisional finishes followed, however, leading to the departure of then-GM Ben Cherington. His replacement at the top of the baseball ops pyramid, Dave Dombrowski, decided to retain Farrell for each of the last two seasons. Regular-season results have followed, as the organization added significant new pieces and paced the AL East with 93 wins in both 2016 and 2017. Unfortunately, though, the postseason results have also been the same: consecutive first-round wash-outs. Of course, there’s only so much Farrell could have done differently to stave off elimination. The Sox were swept last year by the eventual American League champion Indians. And this year, the team ran into an Astros buzzsaw, rebounding to avoid another sweep and make the fourth game competitive but ultimately falling short. Farrell’s tenure had its ups and downs off of the field as well. He battled through lymphoma during his tenure. And Farrell also kicked up some controversy when he and his wife divorced and rumors arose of a relationship with a local reporter. Ultimately, it seems the Boston higher-ups felt that gains could be achieved by pursuing a new direction. Plenty of names have been tossed around in the immediate aftermath of the move, though as yet no clear connections have been made. Clearly, Boston will be looking for someone that can move the team into and through the postseason, though otherwise little is known. Dombrowski is expected to meet with the media later this morning.